← The basics: Who are EB-5 investors, what are Regional Centers, what are EB-5 offerings? With the EB-5 Regional Center program needing reauthorization by September 30 this year, and with the one piece of legislation on the table so far (the Leahy Grassley bill) offering to restructure it while reauthorizing it, I’d like to step back and look at what fundamentally characterizes the Regional Center program. What sets the RC program apart from regular “direct” EB-5 (which doesn’t need reauthorization)? What key features does any Regional Center program reauthorization bill need to protect? The EB in EB-5 stands for employment based, and both direct and Regional Center EB-5 reward investment that results in job creation – 10 or more jobs per EB-5 investor. The major difference lies in which jobs can be credited to EB-5 investors, which in turn affects investment amount and structure and economic impact potential. Consider the following figures. The traditional “direct” EB-5 program only allows EB-5 investors to be credited with “direct jobs,” defined as W-2 employees of the new commercial enterprise (NCE) that receives EB-5 investor equity. This fact limits the countable jobs (and therefore the maximum EB-5 investment) and also possible structures. There can be only one pot in direct EB-5: all the EB-5 money goes in that one pot as equity and only the full time W-2 jobs in that one pot can be credited to investors. If your business involves multiple entities (for example a holding company for the property and a management company for operations), then you have two pots and direct EB-5 won’t work for you (unless the management company is a wholly-owned subsidiary of the holding company, making them essentially a single entity). If your project creates jobs for people who aren’t your W-2 employees (e.g. construction workers on your job site), the direct EB-5 program doesn’t allow counting those jobs. If you’d prefer to segregate EB-5 investors in a separate entity rather than giving them a management role directly in your business and mixing them with your non-EB-5 investors, it’s hard to do that with direct EB-5. If you’d like the EB-5 funds to eventually come into the business as a loan rather than equity, direct EB-5 doesn’t allow that either. All this lack of flexibility results from the fact that there can’t be more than one enterprise/layer involved, which in turn follows from the fact that the buck literally stops with the new commercial enterprise, thanks to the direct job limitation. 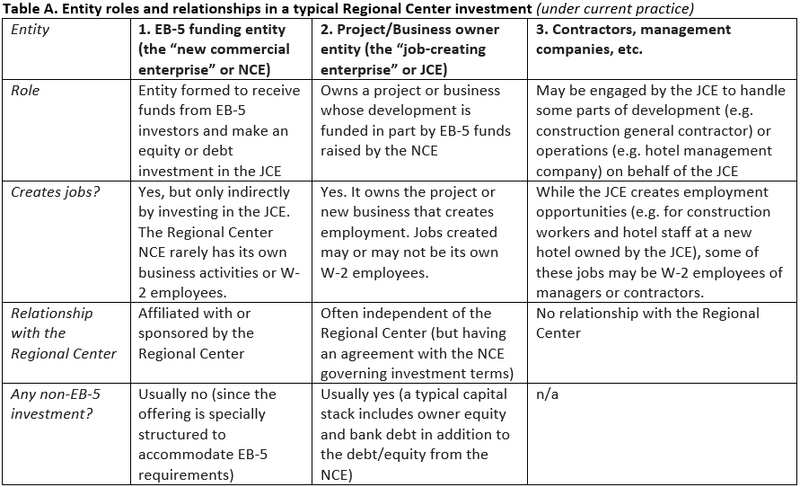 The NCE is where the money has to be invested and spent and where the jobs have to be created; any associated job creation that’s not within that one new commercial enterprise is “indirect” by EB-5 definition and can’t be used to justify EB-5 investment. The Regional Center program provides an attractive alternative to traditional direct EB-5 because Regional Center investors can be credited with “indirect” jobs, which EB-5 policy defines as “those that are held outside of the new commercial enterprise but are created as a result of the new commercial enterprise.” (Policy Memo p. 8) Indirect job creation opens up a new world of structure possibilities. 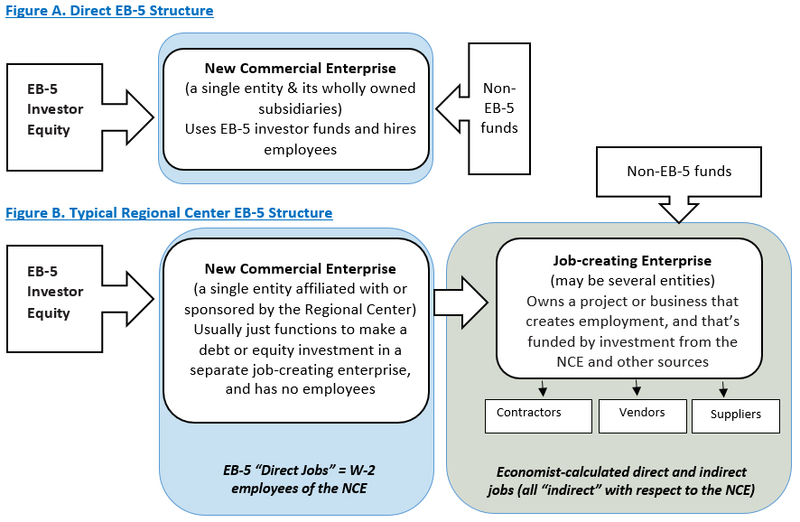 Figure B shows a typical regional center investment with two pots: the new commercial enterprise (NCE) and the job-creating enterprise (JCE). The NCE is still subject to EB-5 requirements (must a single entity, must receive equity from the EB-5 investors, must give EB-5 investors a management role), but the business and job creation are separated in another pot that’s not so limited. The job-creating enterprise can encompass multiple entities, can receive investment from the NCE as debt or equity, can separate EB-5 and non-EB-5 investors, and can raise funds based on economic impact. If the Regional Center NCE has employees, it can verify them by submitting payroll records, just like a direct EB-5 NCE. However the typical Regional Center NCE has no business beyond investment and no employees. Instead, Regional Center investors in the NCE usually take credit for indirect jobs (i.e. the jobs created outside the NCE but resulting from the NCE’s investment – what’s in the green-shaded box in Figure B). These include impacts that an economic model would call direct (relating to the first round of inputs purchased by the subject industry) and indirect (relating to subsequent rounds of inputs purchased by supporting industries). If the job-creating enterprise funded by EB-5 investment is a hotel, the economic model would capture the employees required to build and operate the hotel and also some employment impacts of the hotel’s supply purchases. These new jobs could be on the payrolls of numerous third parties (the general contractor, the hotel manager, etc. ), but it doesn’t matter because the NCE doesn’t have to control payroll records to verify job creation that happens outside it. EB-5 policy allows for using reasonable economic methodologies to calculate job creation outside the NCE but resulting from the NCE’s investment. For an example, the economist could use RIMS II Type II multipliers developed by the U.S. Bureau of Economic Analysis to calculate the employment impacts associated with the verified expenditures and revenues of a project funded by EB-5 investment. Why is all this important? When you’re judging whether a piece of Regional Center reauthorization legislation is worth supporting, keep my Figure B in mind. Make sure that the legislation retains the possibility of the NCE and JCE as distinct entities, crediting EB-5 investors with job creation that’s outside the NCE aka indirect. If that core defining feature is compromised, then whatever the legislation would authorize, it’s not the Regional Center program. The Leahy Grassley bill is currently not clear on indirect job creation or the distinction between NCE and the JCE. The bill proposes regulating Regional Centers as if and assuming that they control JCEs, which is often not the case in the Figure B model (and not necessarily desirable either, considering potential conflicts of interest). A number of provisions are just confusing given the NCE/JCE distinction (ie do the provisions about non-EB-5 investors on p. 6 apply to the NCE or JCE?). Most critically, the bill proposes limiting indirect job creation. Maybe the section on p. 4 only intended to require investors to count some jobs beyond those generated from supply purchases, which is fair, but the terms are not defined and can just as well mean that at least 10% of jobs need to be direct jobs within the NCE, which would destroy the Regional Center model. The benefits that come with indirect job creation are many. It’s possible to raise more EB-5 money when you can count more jobs – not only the W-2 jobs in a single entity but the wider economic impact of a given project. It’s possible to fund larger and more complex businesses when you’re not limited to all spending and employment occurring within a single entity. It’s possible to be a Regional Center and raise money for various independent projects in the community when you can set up NCEs separate from the JCEs and can verify job creation using economic methodologies. Architects of the Regional Center program intended it to facilitate the concentration of EB-5 immigrant investor capital into larger projects deemed more likely to have significant regional and national impact. Indirect job creation has made this vision possible. A typical direct EB-5 venture raises less than $2 million, as compared with raises in the tens of millions per project possible with indirect job creation and a Regional Center structure. We wouldn’t be talking about EB-5’s $3.58 billion contribution to GDP if we didn’t have the Regional Center program.